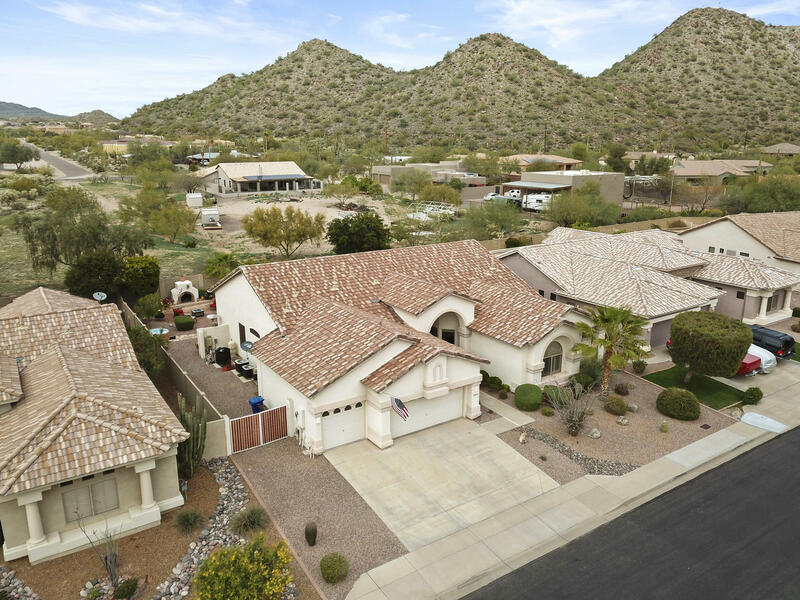 This Beautiful Mountain View home has 3 bedrooms PLUS den and 3.5 baths! Highly upgraded! Gorgeous Kitchen with Granite counters & upgrd cabinets with Wine fridge. Over 3000 sqft. One story! Heated Pool with vessel waterfalls- new in 2015! New interior paint this month! New dishwasher & water softener also! Split floor plan. Spacious living and dining room PLUS family room with fireplace! Neutral tile and carpet. Huge Master with views to the backyard oasis. Enjoy the built in BBQ, Golf putting green & fireplace while family and friends are in your HEATED POOL and Spa! One in a million! Large Laundryroom with sink & cabinets. RV Gate. All appliances included. One story with no interior steps. Located near Hwys, shopping and is on the way to Usery Park and the Saguaro Lake. *more More home notes: Two bedrooms share a Jack & Jill full bathroom, and there is a hall full bath PLUS a powder room near the garage and laundry room 3.5 baths total! In March 2019 the interior house was painted Agreeable Grey, and the dishwasher and water softener were replaced, and the kitchen, hall bath and powder room faucets were replaced in 3/19 also. New Pool in 2015 is Heated with water features, pop up cleaning and is pebble tec.. it is 28' x 14'. The BBQ is plumbed gas. NO NEIGHBORS BEHIND! Walk in pantry. Electric stove with double oven. Tile grout and carpet cleaned March 2019. 3 car garage with above storage. Lighting updated in 2017 with added recess lighting also.